"Sunnyvale, Calif.�August, 2008�OCZ Technology Group, Inc., a worldwide leader in innovative ultra-high performance and high reliability memory, components, and systems, today announced its latest contest, �Win with the nia,� where competing gamers can use the revolutionary Neural Impulse Actuator to compete at national and regional levels for prize money and OCZ computer products. Gamers from all over the world will have the chance to put their nias to the test at LAN parties and e-sport competitions around the world, showing the gaming world just how incredible this new input device is at increasing immersion and lessening reaction times in the top PC titles. Please visit the "Win with the NIA" Contest page here for a complete list of rules, contest details, and qualifying LAN Events." "Fremont, CA, July 31, 2008 � Corsair�,a worldwide leader in high performance computer and flash memory products, announced today that its Dominator DDR3 memory modules have again shattered the world record for frequency. The record was set using the Asus ROG Rampage Extreme motherboard (Intel X48 chipset) and Corsair Dominator memory, utilizing Corsair�s award-winning DHX technology. Corsair previously announced on May 20th its world record of 2462MHz and has now raised the record up to 118MHz faster. Corsair achieved these results as part of ongoing lab experiments on the effect of temperature on memory performance. The 2580MHz memory speed was achieved with the entire test platform -- including motherboard, CPU, chip set, and memory -- chilled to -20 degrees Celsius. Corsair Dominator Memory contains ultra fast chips cooled using Corsair�s proprietary Dual-Path Heat Xchange Cooling Technology (DHX). Dominators are used inDell, HP, Alienware and most high performance gaming systems. Corsair Dominator modules are available worldwide through authorized distributors and resellers in a variety of speeds and densities. Corsair memory products are backed by a lifetime warranty. Complete customer support via telephone, email, forum and the Tech Support Express Helpdesk are also available." "IRVINE, Calif., July 15, 2008 � Toshiba Storage Device Division (SDD), the pioneer in small form factor hard disk drives (HDDs), today announced the industry's first commercially available 200GB-per-platter 5,400 RPM HDD, which will provide the highest HDD capacity at 400GB for integration into mobile PCs for the holiday season. In addition, the company also introduced a new family of high-end 7,200 RPM HDDs, offering up to 320GB storage capacity and superior performance. The standard 9.5-millimeter-high package of both HDDs fits existing product designs, enabling an easier migration path to high-capacity storage for portable PC, gaming and personal storage manufacturers catering to the diversified needs of mobile users in the digital age. In addition to increasing areal density to 308 gigabits-per-square-inch, the 400GB MK4058GSX incorporates acoustic techniques that make the 5,400 RPM HDD nearly inaudible during seek operations. The large storage capacity and silent operation of the MK4058GSX are particularly suited for video and audio playback. For optimum user experience in data-intensive applications such as image processing, video editing, multimedia and gaming, Toshiba�s new 7,200 RPM, MKxx54GSY series delivers first-rate performance through a combination of factors, including optimized firmware, caching algorithms and fast data throughput of 1,020 megabits per second. The MKxx54GSY provides a variety of capacity options ranging from 320 to 80GB. For added durability in mobile applications, free-fall sensor options also are available on the new HDD series." 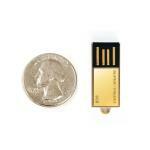 "San Jose, California � July 15, 2008 -- Super Talent Technology, a leading manufacturer of Flash storage solutions and DRAM memory modules, today announced the PICO-C Gold, a 24-carat gold plated, water resistant USB drive that weighs less than a nickel (~4.7 grams), is smaller than an SD card, and can store over 2,000 MP3 songs. �Is it the speed, the ruggedness, the water resistance, the incredibly tiny size or the pure elegance that people like most in our Pico-C drive? Who knows? But, this combination of features and style is not offered in any other terrestrial storage device, which makes it a real craze�, commented Super Talent Marketing Director, Joe James. All Super Talent USB drives are backed with a lifetime warranty. The 8GB Pico-C Gold drive, part number STU8GPCG, is available from NewBiiz and NewEgg today for under $40." I think they finally figured out what we overclockers have been doing. "As computer chips get smaller and are pushed to work harder they are also getting too hot for digital gear to handle. That's why IBM researchers believe that liquid cooling microprocessors, instead of air (or fan) cooling them, will be more effective. Researchers from IBM's Zurich Research Lab and Berlin's Fraunhofer Institute have figured out a method to send "tiny rivers of water" through layers of chip stacks. So-called 3D chip stacks are better for computer speed than the standard side-by-side CPU configurations because stacks reduce the distance between circuits and in turn speed up processing time. That translates into software applications running faster and more reliably." Verizon has acquired Alltel with the final price of $28 billion. "Once this transaction closes, customers of both companies will have access to an expanded range of products and services, including a premier lineup of basic and advanced devices and an expanded IN Network calling community. Alltel customers also will benefit from advanced services including over-the- air downloadable music from a three-million-song library, and a network that is nationwide, for a uniform coast-to-coast experience. They also will be able to take advantage of industry-leading consumer policies, including Test Drive and Worry Free Guarantee�. "This move will create an enhanced platform of network coverage, spectrum and customer care to better serve the growing needs of both Alltel and Verizon Wireless customers for reliable basic and advanced broadband wireless services," said Lowell McAdam, Verizon Wireless president and chief executive officer." I'm sure this release will be just as good as the beta. "Firefox fans looking for a major update to the open-source Web browser probably will get a final version of it next month. "We're looking for final ship sometime in June," said Mike Schroepfer, Mozilla's vice president of engineering, in an interview Wednesday. Mozilla, which was spun out of AOL more than 10 years ago, oversees the Firefox programming project." The Roku box is here! "NEW YORK (AP) � It's the big horse race in the gadget market this year: Who's going to win consumers' hearts with a box that brings Internet movie downloads to the TV set? Now, we have a tiny box that deserves to be a winner. Roku Inc., a small maker of Internet-connected media devices, this week introduced a black box that grabs movies and TV shows from Netflix, the DVD rental-by-mail pioneer. You attach the Netflix Player to your TV, and connect it to your home broadband connection over Wi-Fi or a cable. Pick a movie using the included remote, wait a minute for the download to start, and then watch on your TV. There are couple of other boxes on the market that do the same thing, including the Apple TV. The Roku Netflix Player, which is half the size of a Nintendo Wii, isn't really better than any of them, but it has one tremendously attractive feature: its price. In a shaky economy, that's the kind of feature that seals the deal. It costs just $99.99. Even more importantly, it's cheap to use. If you already subscribe to Netflix's DVD rentals, you pay nothing extra to watch as much Internet video as you want, as long as your monthly plan is $8.99 or more."